A rider in the Mid-Week MTB Race Series held at Corner Canyon. There are many options for cross country racing in Utah. It’s only fitting that Utah, home of the internationally famous Slickrock trail, should offer mountain bikers a wide variety of events in which to test one’s skills and fitness. There are events for downhillers, cross country and enduro riders. Where: all over, from Wellsville to St George and Fruita to Dugway. Racer Categories: kids, junior, beginner, sport, open, expert and pro, mostly in age groups. Registration Fee (online): kids: $5, juniors: $20, Beginner to Expert: $33, Pro: $38. Add $10 for day of registration. $10 for a number plate for the season. Utah’s longest running mountain bike series, the Intermountain Cup, has already started! First race of the season was back in early March down in St George, for those who could not wait to get their race plate on. Course length varies according to the race category. Intermountain Cup races are for the truly committed, taking up a good chunk of your Saturday, or weekend for the more distant events. This season features new race venues at Fruita, CO and Dugway, UT. Awards are presented for place getters after each race, and there is an overall series competition for individuals and teams. Where: 6 venues: Corner Canyon, Round Valley, Heber, Deer Valley, Solitude, Snowbird. Racer Categories: Kids under 12, co-ed Beginners, Sport Women, Sport Men under 35, Sport Men over 35, Expert Women, Expert Men, Pro Women, Pro Men. Registration Fee: $15 per race, plus a one- time $5 number plate fee. Kids 12 and under are free. The Mid Week Mountain Bike series is an after work, lung searing short course sprint series. Need some interval training? This is it. Race length varies depending on division. Usually Pro & Expert race approximately 12 miles & 2,500 vertical feet, Sports go 8 miles and 500-2000 vertical feet and Beginners pedal 4-5 miles and 300-1000 vertical. BBQ's and raffle prizes follow the races, and racers will be competing for a piece of at least a $7,000 purse and some insane end of season raffle prizes. Where: Sundance Resort, Soldier Hollow, and two new additional venues this year. Registration Fee: $12 per race, plus a one-time $10 number plate fee. Kids race for free. This series has been running since 2002 and is ideal for all ages and abilities. This grass roots series is a great mid week workout for riders located in Utah Valley and the Wasatch Back. A super fun variation is the occasional biathlon at Soldier Hollow using the target shooting range from the winter Olympic ski biathlon. Racers are in with an equal chance to win raffle prizes after each race, and performance points are accumulated for end of season prizes. This is the local mid week workout for Ogden locals, and others who want to mix in some variety. Raffle prizes each week and end of season prizes for cumulative points. 1-3 Laps depending on category; 5-15 miles. Registration Fee: 50 milers: $90 each or $160 for both. 25 milers: $45 each or $80 for both. For 2014 the USCS has condensed to two challenging 2 lap, 50 mile events. There is also a one lap 25 mile option at each event for the non-crazies. These races offer fully stocked feed zones and are open to all abilities. Prizes go to all top 3 winners in each category with a cash payout to the Pro’s. These 50 mile races require fitness, planning and commitment. Aim big. This could be the year of your first 50! 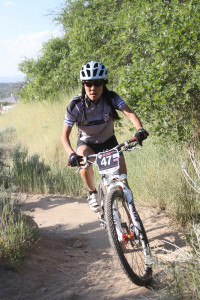 As part of the National Interscholastic Cycling Association, the Utah League provides a structured environment for high school students to participate in organized mountain bike events. Must be a member of a high school team to participate. The Utah League offers more than racing, with adult leader/coach trainings sessions and rider skills clinics and family riding camps as well. This year, a junior development team for 7th & 8th graders is being launched.